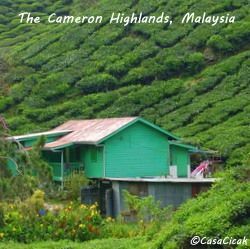 Situated somewhere near the centre of Malaysia, high in the Titiwangsa mountains are the Cameron Highlands. Situated at up to 1500 metres above sea level they were developed during colonial days, offering a cool respite from the heat and humidity of this tropical outpost. Today, they are famous for good hotels, such as the Century Pines resort, tea plantations, strawberries, market gardening and tourism. Follow me and my husband as we drive from our home in Penang to begin a two week road trip of Malaysia, first of all enjoying a three day adventure in the Cameron Highlands. Let me share our favorite hotel and the places we visited before we set off down the winding road towards Kuala Lumpur and then onwards to Cerating and Kuala Terengganu. Situated in the north west of the state of Pahang, the Camerons borders onto the neigbouring states of Kelantan and Perak. There are three main towns that you might wish to visit - Brinchang, Ringlet and Tanah Rata and they are all situated at different altitudes. Ringlet is the lowest town at 1135 meters above sea level (3723 feet), Tanah Rata, by far the nicest of the three towns is situated at an elevation of 1440 meters above sea level (4724 feet) and Brinchang is 1500 meters above sea level (4921 feet). The Highlands are about 153 miles (246 kms) from Penang, 120 miles (200 kms) from the Malaysian capital city of Kuala Lumpur and 56 miles (90 kms) from the state capital, Ipoh. You cannot fly to the Cameron Highlands and if you don't have your own transport then the cheapest way to get there is by coach from Singapore, Kuala Lumpur or Penang, local bus from Ipoh or mini bus from Taman Negara. Taxi travel is also very affordable in Malaysia and it would be an option to hire a taxi to take you from Penang or KL to the Highlands, espescially if there are more than one of you.. We have travelled from KL to Penang by taxi before, and it's a lovely way to get to see some of the countryside. Having packed up our small Perodua Myvi for our 2 week tour of Malaysia, we waved farewell to our apartment and headed for the bridge that joins the island of Penang to mainland Malaysia. Our first destination of our 4 centre vacation (that turned out to be three, but that's another story) was the Pines Resort in Tanah Rata in the Cameron Highlands. Situated 153 miles (246 kms) from Penang it is a drive that can be completed in 4 hours or so, depending on the weather and the time of year. As we crossed the Penang Bridge and turned right onto the North-South Expressway we headed south in the general direction of Ipoh. Unless it is a local holiday the highway is remarkably empty, and as you pass through huge plantions of palm oil trees it is easy to imagine what colonial Malaya looked like when it was planted with mile after mile of rubber trees (some of which can still be seen today). About 12 miles (20 kms) before Ipoh we beared left onto the Simpang Pulai Highway. 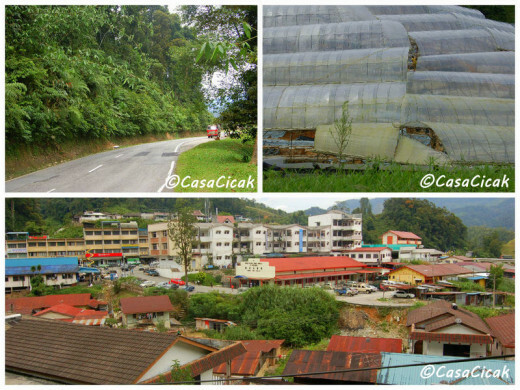 There are two main routes into the Cameron Highlands from the North-South Expressway. The one we took is used by visitors heading from the north and leads to the town of Brinchang. For those travelling from the south, they exit the Expressway at the town of Tapah and take the winding 25 mile (40kms) mountain pass to the Highland town of Ringlet. This picturesque but slower route is the way that we left the Cameron Highlands, en route to our second destination of Kuala Lumpur. As we began our climb upwards the air became clearer and noticeably cooler. 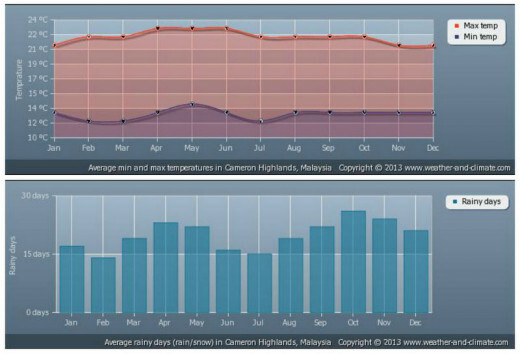 In July Penang has average daytime temperatures of 31 degrees celsius (88 degrees F), dipping to a balmy 23 degrees (74F) at night, high humidity and low air quality due to crop burning in Indonesia. Whereas our destination of Tanah Rata has average daytime temperatures of 22 degrees celsius (72 F) dropping to 12 degrees ( 54F) in an evening. Definite cardigan wearing weather! Our first impression of the Cameron Highlands was not favourable. Situated at an altitude of 4921 feet (1500 meters) above sea level (4921 feet) Brinchang is a typical Malay market town, a little bit scruffy, and surrounded by the poly tunnels of the local food producing industry. We carried on driving, to our pre-booked destination of the Century Pines Resort in the much nicer resort town of Tanah Rata. 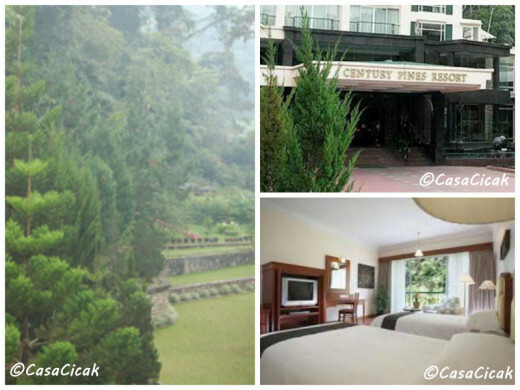 Our choice of accommodation whilst staying in the Cameron Highlands was the Century Pines resort in Tanah Rata. It is situated very close to the town centre, which makes it perfect if you arriving at the coach station, or if you just fancy walking to Starbucks for a coffee. Hotels in Malaysia are excellent value for money and the level of service they offer is amazing. I didn't realise how much I would miss having my bags whisked to my room and a personal level of service until we moved to El Salvador, where even the best hotels do not come anywhere close for customer service. The hotel is an average Malay hotel, not over priced, nicely furnished, decent sized rooms - and the biggest beds we have ever seen. Senor Cicak is 6 foot 4 inches and when he lay across the bed there was a good foot and a half to spare, so we estimated the bed to be about 8 foot wide! There is plenty of car parking available if you make your own way there, and if not its central position for both the town and nearby walks makes it the perfect location. Breakfast is included, and if you have never experienced a Malaysian buffet breakfast before you are in for a treat. You will usually find everything on offer from cereal and toast, through the normal cooked breakfast items (although this may include beef bacon rather than pork, with it being a Muslim state) to roti's and curry. Curry for breakfast might sound weird but it kind of grows on you, and roti canai are certainly more than acceptable. As part of our package we not only got breakfast included, but also a steamboat dinner on one evening. If you have never tried a steamboat, you basically receive a big pot of broth and a griddle and an assortment of vegetables and meat to cook yourself at the table. I found it great fun trying to hold down my baby squid legs so they would cook thoroughly, but my husband was a lot more squeamish and opted for less life like meat. I can thoroughly recommend the Century Pines resort in the Cameron highlands as being a good place to base yourself whilst you tour the local area. 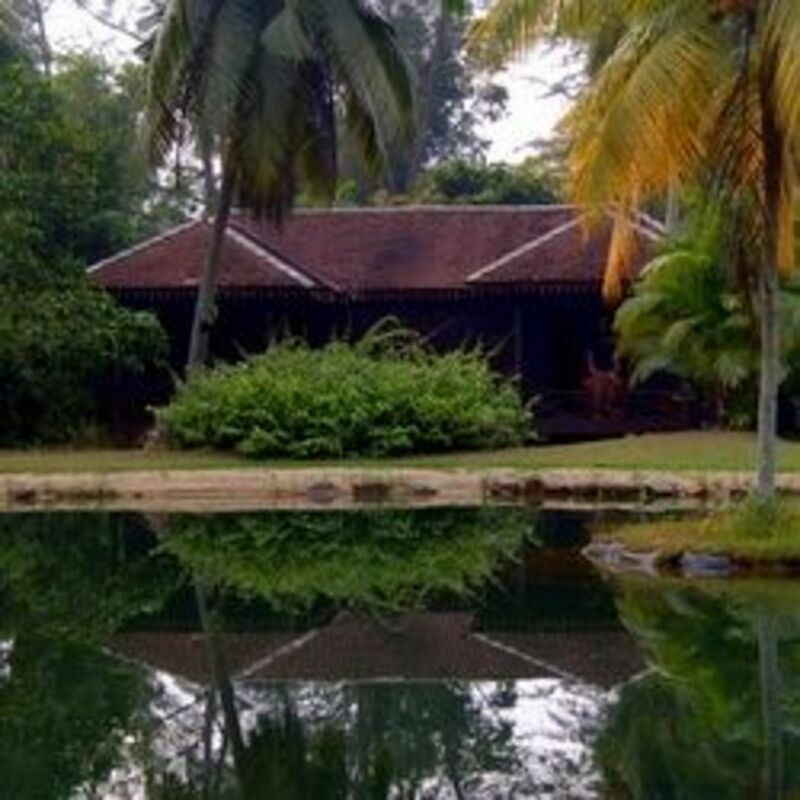 When planning your trip to Malaysia and the Cameron Highlands it is important to remember that Malaysia is a tropical country and has a lot of rain forests. It also follows therefore that it gets a lot of rain. On average, the coolest month is January whilst the warmest month is May. October has the honour of being the wettest month and July is the least wet - notice I hesitate to use the term driest. Personally, if I was going to the highlands I would choose a dry time of year if I wanted to do a lot of outdoor activities. 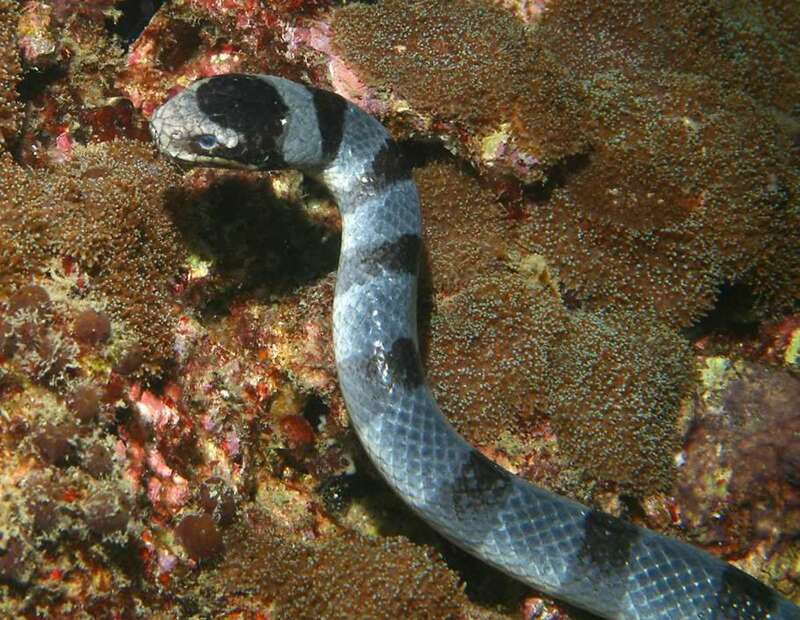 We went in July, the driest month, but as we already lived in Malaysia, at sea level where it extremely hot and humid, we were already aclimatised. Visiting a tea plantation was high on our list of must see sights in the Cameron Highlands. Although Senor Cicak is very much a confirmed coffee drinker, tea is my preferred hot drink of choice and I was keen to see where it came from. 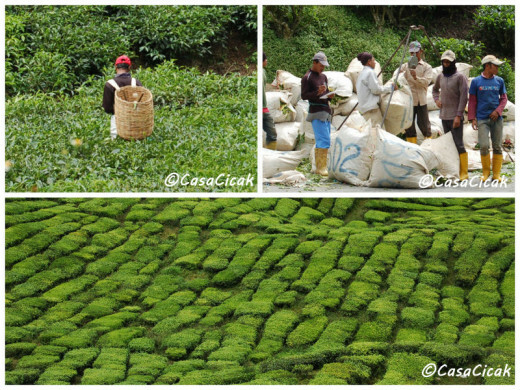 When you first see a tea plantation at the side of the road you will be amazed. The carefully clipped tea bushes hug the contours of the mountain, forming a picturesque view. Boh own most of the tea plantations in the area and at Sungei Palas they have opened the BOH Tea Centre where you can see how tea is produced, sit on the terrace overlooking the plantation whilst sampling a cup of their finest, and buy souvenirs in the adjacent shop. As we drove up to the Tea Centre we saw tea pickers practising the art of picking the leaves correctly and workers carrying the wicker baskets on their backs, full to the brim with tea leaves, as they traversed the contours to get back to the roadside collection points. The Smokehouse Hotel is famous for bringing a little bit of England to the Highlands of Malaysia. With quintessentially English gardens and décor, open log fires and a friendly English atmosphere you could be forgiven for thinking you were somewhere in the home counties. If you visit between 11:00 am and 6:00 pm you can sample their famous afternoon tea. When we visited we had delicate little sandwiches, freshly baked scones with homemade strawberry jam and cream, all washed down with what else but cups of tea, served English style with milk, and sugar if you like it that way. 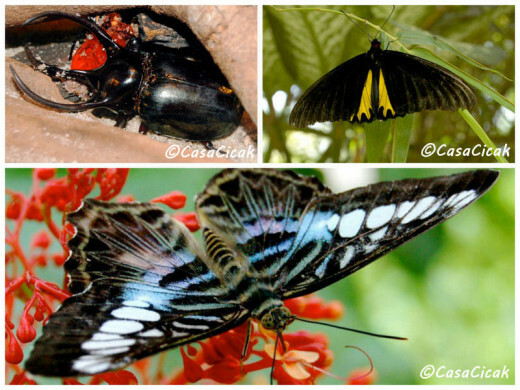 Situated at Kea Farm, just outside of Brinchang, is the Cameron Highlands Butterfly Farm. Opening at 9:00 every morning and closing at 6 during weekdays and 7 at the weekend, it costs a mere RM5 for adults and RM3 for children. With a butterfly house, tropical flower garden, insects and reptiles and amphibians there is plenty to see. Even if you are normally squeamish around insects it is well worth a visit, as they have a good collection of tropical Malaysian bugs. If you are used to small ordinary looking butterflies and moths that are to be found in western gardens just wait until you see the myriad of jeweled giants flying around inside the butterfly house. I really don't like large beetles and bugs (which is a downside when you live in the tropics and huge cockroaches are kind of commonplace), but even I was fascinated. If you have a car with you then you should take the opportunity to get out and see some of the highland scenery. If you don't have a car you can either use the local bus service or book a taxi. It is easy to book a taxi for a set period of time or to negotiate with the driver to wait for you whilst your sight see and then take you to your next destination. The Thompson waterfall, named after US silk trader Jim Thompson who went missing in the area are well worth a visit. You will find stalls at the side of the road selling typical Malaysian snacks and souvenirs. 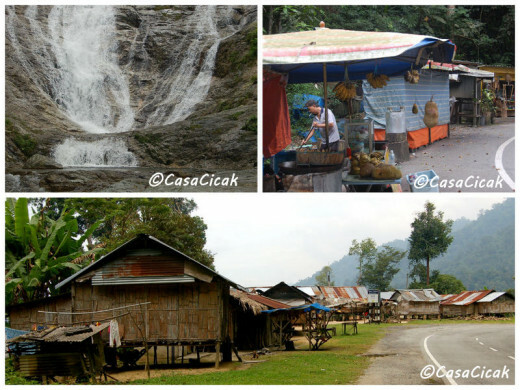 You might also be lucky enough to see local kampongs (villages) that look as if they have not changed in generations. We just happened to chance on this village when we were en route to the waterfall, and I couldn't resist stopping to take a photo. 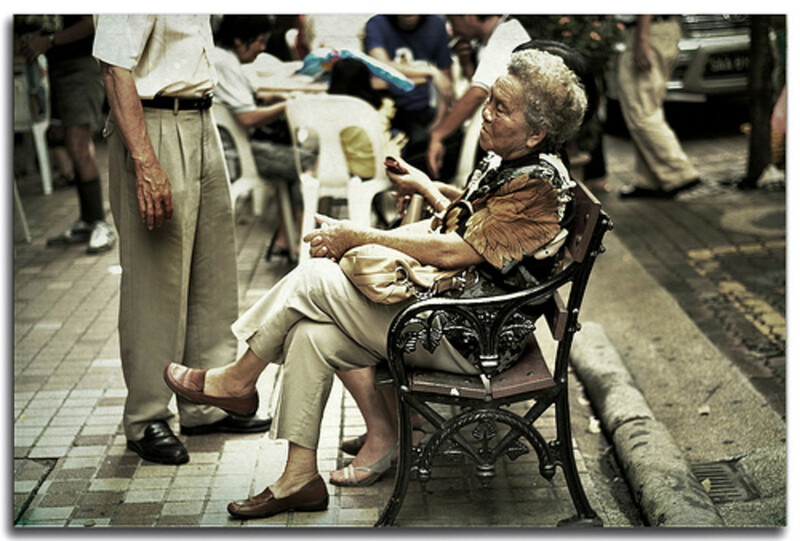 Whilst they are a great photo opportunity always remember to respect the people who live there. I always try not to get too close and if I want to photograph people I always ask first. Most people, espescially children are fascinated by seeing their image on a digital camera screen. If you would like to see a kampong up close then it is possible to book trips to see an Orang Asli village and see for yourself how the local Semai tribe live. 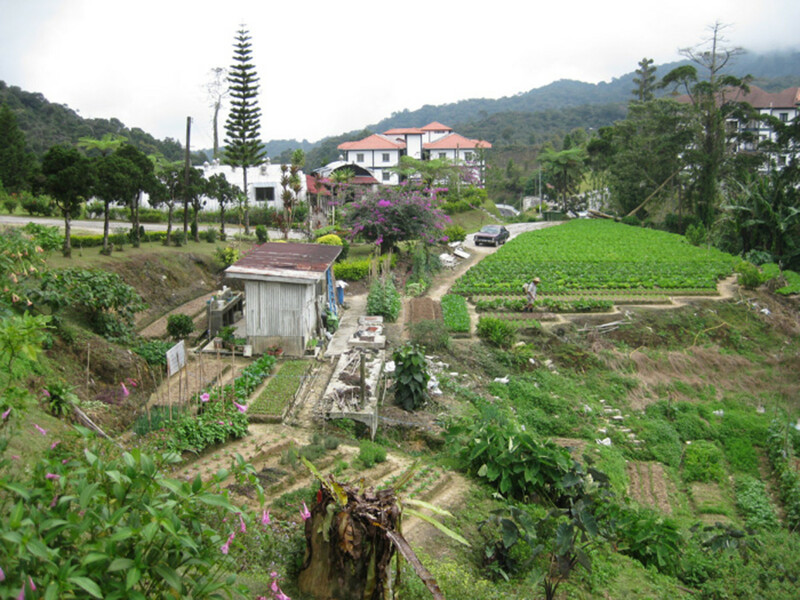 Take a look at the history of the Cameron Highlands. Visit this buzzing market on Friday and Saturday nights. Kea Farm is the agricultural district and it has a popular vegetable market. 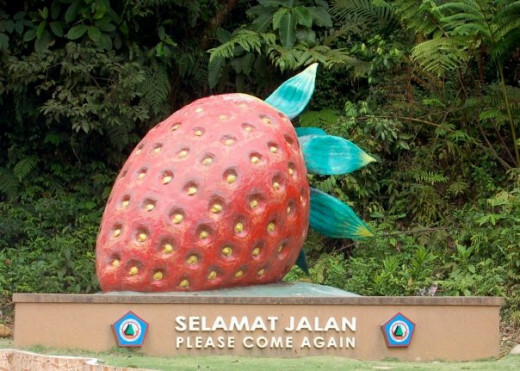 Walk to this popular attraction from, Brinchang and sample their home grown strawberries. Malaysia is full of temples, and this Buddhist one is worth a visit. Love honey? Visit this bee farm to see how its made and buy some loca lhoney as a souvenir. Jim Thompson was a US businessman who made his fortune in Thai silk. On Easter Sunday, March 26, 1967 he took a walk from his bungalow in the Cameron Highlands and was never seen again. The Cameron Highlands covers the same area as Singapore. 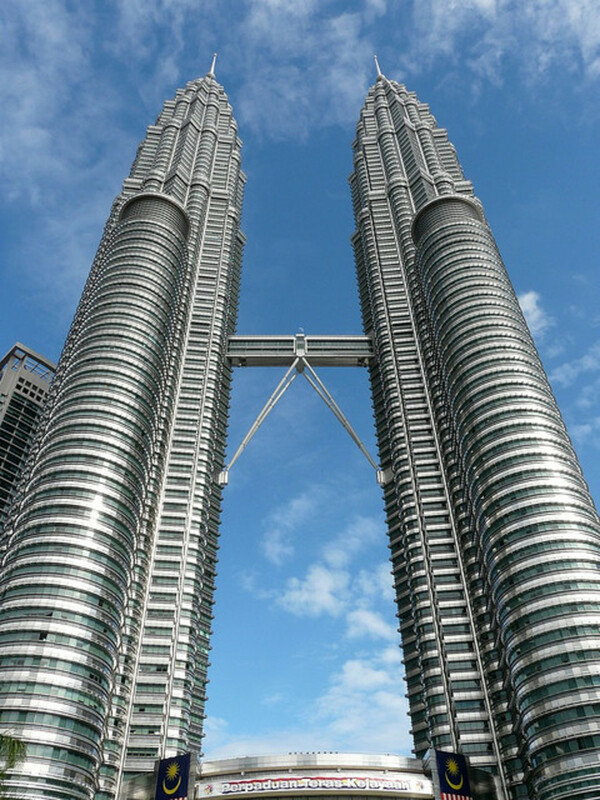 What Other Names Are The Titiwangsa Mountains Known As? 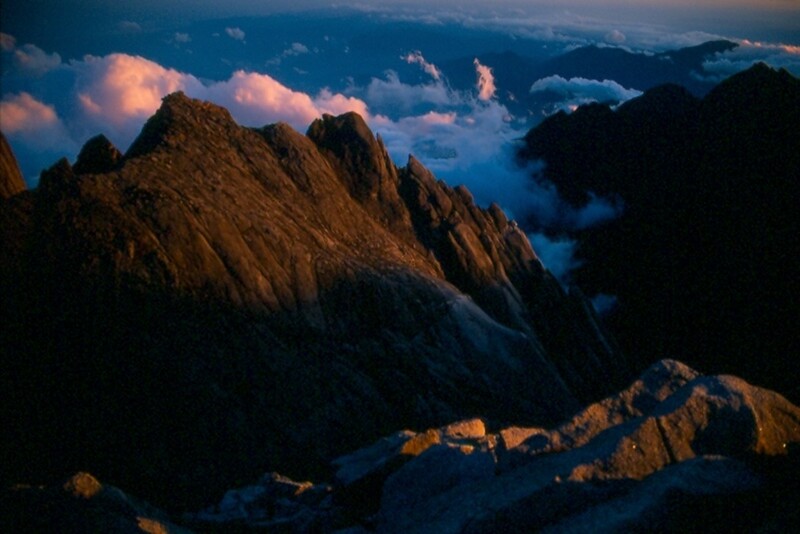 The Titiwangsa Mountain range is known as Banjaran Besar by Malays and the Sankalakhiri Range when it enters Thailand. The Petai Bean Makes Your Urine Stink? Our three nights in the Cameron Highlands came to an end to quickly. We thoroughly enjoyed our break, and it was amazing to see the tea plantations up close. So onwards and downwards, we packed up our trusted Myvi and set of down the winding mountain road in the direction of Kuala Lumpur, next stop the Royal Bintang Hotel at the Curve Mall. Time to sample the delights of Ikea, Debenhams and Marks and Spencers, three of the things that a British expat living in Southeast Asia dreams of! Follow Marvellous Malaysia board on Pinterest for more Malaysian magic. Have I inspired you to visit the Cameron Highlands? What a stunning lens and a beautiful tribute to your beloved Cameron Highlands. Your photos present an compelling invitation to visit. Yes you have! Great lens, love the photos.